Bid on your dream holiday or luxury travel item for as little as £0.99, from anywhere in the world. Find out more in our Auctions FAQ. This auction was won by G***n.
is used for your security. Find out more. 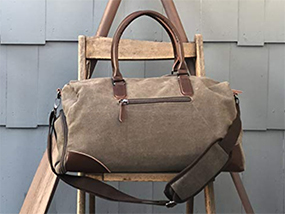 This auction is for a stunningly stylish Sona Weekender Canvas Bag with leather detailing, hand straps and detachable shoulder strap. The perfect companion for luxury getaways. Sona Weekender Canvas Bag is valued at approximately $50 USD / £40 GBP*. Auction Shipping: This auction includes complimentary shipping within the USA only. All other destinations are excluded from this auction. Sona is a family owned company that creates bags that are designed to be simple yet stylish. The have created a range of bags perfect for a light lunch at the office with friends, through to a quick weekend getaway. No matter the occasion, Sona has you covered and will ensure you look great too! This auction is for a stunningly stylish Sona Weekender Canvas Bag (dimensions: 18.5 in x 11 in x 8 in). The bag features: leather hand straps, a detachable shoulder strap, 2 inner pockets, two pen holders, padded laptop pocket, a room/auto key holder clip as well as a separate compartment for shoes. The bag also has an outside pocket for frequently needed items and includes a free dual-compartment toiletry bag. Luxury Travel Diary terms and conditions apply. *This auction is for one Sona Weekender Canvas Bag valued at approximately $50 USD – please note this valuation is the list price provided to Luxury Travel Diary by the Auction Prize Provider and should be used as a guide only as cheaper discounted rates may be available. No cash alternative is available. This auction item includes complimentary shipping within the USA only. All other destinations are excluded from this auction. Prize will be posted directly to the winner from Sona. Winners must pay for their auction item in full via PayPal within 48 hours of the auction end. The full Terms of our auctions can be found here. To the fullest extent permitted by law, Luxury Travel Diary will not be liable for any loss or damage arising out of the winners’ use or enjoyment of the prize; and the winner acknowledges that Luxury Travel Diary accepts no responsibility whether directly or indirectly for any claims whatsoever arising in respect of the prizes provided by third party providers or sponsors. Please note, if you win this auction you are not permitted to bid on another auction prize from the same provider within the same year, this is to ensure as many different bidders as possible get to experience this great brand.